For 100 years, La Milagrosa Catholic Church served the Latino community at 1903 Spring Garden Street. It was the first Catholic Church in Philadelphia to offer Mass services entirely in Spanish. The formal name in Spanish is Capilla Católica Hispana de la Medalla Milagrosa, which translates to Spanish Chapel of Our Lady of the Miraculous Medal. From the outside, the building seems like a row of normal, gray townhouses. On the inside, it was a loving community for Catholic Spanish-speakers in Philadelphia. In the early 1900s, Spanish-speakers in Philadelphia wanted a place where they could practice their faith in Spanish. However, there were no Spanish-speaking priests in Philadelphia at the time. They reached out to the Archdiocese of Philadelphia, who then contacted the Vincentian Fathers in Spain. They sent Father Anthony Casulleras to Philadelphia in 1908 to lead an all-Spanish Mass. In 1909, La Milagrosa officially began holding services. Mass was originally held at Old St. Mary’s Catholic Church at 252 S 4th Street. Soon, the old school building where they held Mass became too small for the rapidly growing community. 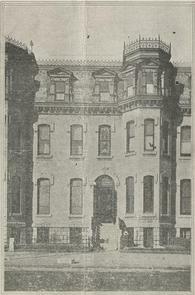 In 1912, La Milagrosa acquired its current location on Spring Garden Street. Mother Katherine Drexel was a supporter of the church, and helped the Father purchase this new building with a grant of $1,080. Her donation came with some conditions. If the African American members of the Spanish-speaking community were not welcomed in the church, she would rescind her donation. At this time, there were around 150 African American members of the Spanish-speaking community. With a new, larger location, La Milagrosa was able to provide more services for the Latino community. The area of Spring Garden grew into a Latino neighborhood, with an especially prominent Puerto Rican population. By the 1920s, La Milagrosa was becoming a large cultural center. Many of the members of the church lived in the general area, but others traveled from around the City. Throughout the 20th century, Latino immigrants from many Spanish-speaking countries found a home at La Milagrosa. The church offered English classes and helped new immigrants find jobs. Members of the community called the church the “Plymouth Rock” of the Latino community in Philadelphia. In 1976, the Vincentian Fathers stopped providing priests for the church, but they still owned the building in Spring Garden. The Archdiocese of Philadelphia continued holding services at La Milagrosa. In 2012, the Archdiocese announced that the Vincentian Fathers were selling the church. The money from the sale would support retired priests in Spain. Upon this announcement, the Cathedral Basilica of Saints Peter and Paul dedicated a weekly Spanish Mass for the members of La Milagrosa. On April 21, 2013, supporters held La Ultima Misa (The Last Mass) outside of La Milagrosa. They wanted to bring the community together to protest the selling of their beloved church. The Vincentian Fathers still owned the building, and the Archdiocese of Philadelphia did not have the funds to purchase it. There was nothing the Latino community could do to save their church. La Milagrosa, the first and only all-Spanish speaking church in Philadelphia, closed its doors officially in June 2013. Following the church’s closure, former members spoke about the loss. Marisol Liceaga-DiRenzo remarked that the Latino community at the time was in mourning. She said, "it's our history, our piece of American history that was given to us.” Many former members believe that the Archdiocese could have tried harder to save La Milagrosa. Pope Francis’s visit in 2015 sparked more comments about the closing. Miguel Ortiz, a former council member at La Milagrosa, referred to the former members as the “abandoned of the church.” According to Ortiz, some former members have stopped going to Mass after La Milagrosa was forced to close. Just as the founding of La Milagrosa united the Latino community in hope, its loss unites them in mourning. Baldwin, Lou. “100 Years and Still Going Strong at La Milagrosa Chapel.” CatholicPhilly.com, 25 May 2011. http://catholicphilly.com/2011/05/news/100-years-and-still-going-strong-at-la-milagrosa-chapel/. Accessed 5 October 2018. Capilla Católica Hispana de la Medalla Milagrosa. 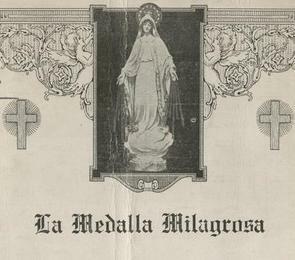 La Medalla Milagrosa. 1915. https://digitallibrary.hsp.org/index.php/Detail/objects/14538# . Accessed 5 October 2018. Joyce, Jennifer. “Phila. 's Oldest Hispanic Church Holds Final Mass.” 6abc Action News, 23 June 2013. https://6abc.com/archive/9149040/. Accessed 17 October 2018. Newhouse, Sam. “We are the Abandoned of the Church.” Metro US, 17 March 2015. https://www.metro.us/philadelphia/we-are-the-abandoned-of-the-church/zsJocp---K0DhFfwA24sE. Accessed 17 October 2018. Vazques, Victor. “Tobacco, Trains, and Textiles: Philadelphia’s Early Spanish-Speaking Enclaves, 1920-1936.” Pennsylvania Legacies, November 2003. Vourvoulias, Sabrina. “Losing Our History.” Al Dia News, 4 October 2012. http://aldianews.com/articles/opinion/losing-our-history/29636. Accessed 5 October 2018. “Keep La Milagrosa Church on 1903 Spring Garden Open.” Change.org, 21 April 2013, https://www.change.org/p/archbishop-of-philadelphia-charles-j-chaput-keep-la-milagrosa-church-on-1903-spring-garden-open. Accessed 5 October 2018. “Update Regarding La Milagrosa, the Miraculous Medal Chapel.” Archdiocese of Philadelphia, 28 September 2012. http://archphila.org/press releases/pr002037.php. Accessed 5 October 2018.